This screen lets you set sundry options for the gadget. Ticking this box shows the rate of ascent / descent in feet or metres per second instead of per minute. The vertical rate is only shown on the flyout view. 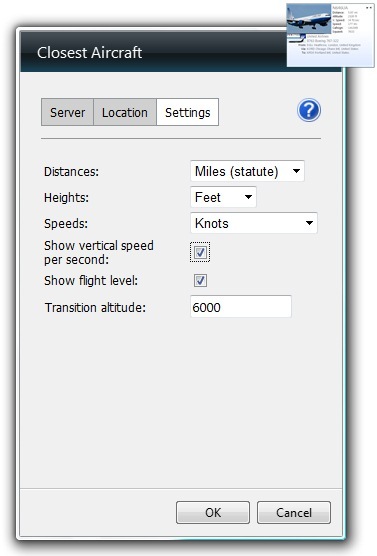 Ticking this box shows the altitude as a flight level once the aircraft is at or above the transition altitude. Flight levels are shown as the height in feet divided by 100, so FL370 is a height of 37,000 feet. This is only used when Show flight level is ticked - it determines the height at which altitudes are shown as a flight level.